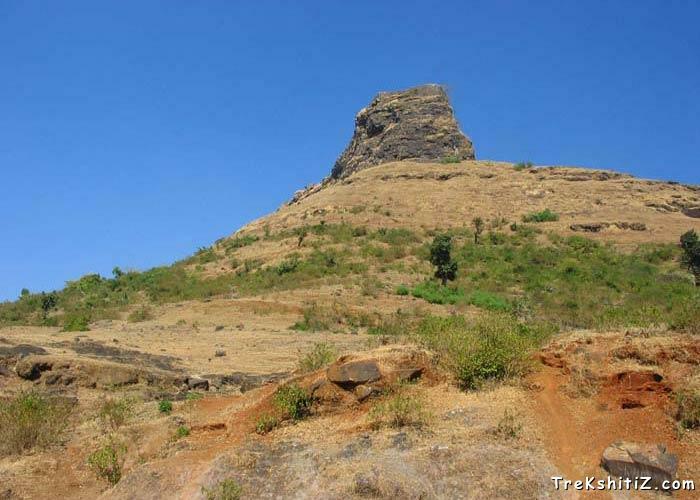 Hatgad fort stands overlooking Surgana taluka from where the eastern range of Sahyadris starts called as Saatmal range. This fort is branched from the main mountain range. Before entering the fort, to the right side of the first doorway there is water tank cut in rock and a carved Lord Hanuman sculpture. This doorway is in a dilapidated condition with only pillars standing. There are two scriptures carved in rock near the doorway. Moving ahead there is a second doorway which is carved in rock and is tunnel shaped just like that of the entrance of Harihar fort. Besides this there is a cave with three water tanks in it. Further, there are the third and fourth doorways. It takes around an hour to visit the fort top. To the left of the fourth doorway there is a descending path. Here one can see the fortification wall still in good condition. There is also a tombstone here. To the right there is a water tank and an arch shaped structure. To the right of the fourth doorway towards the top there is a water tank. Moving further one comes across remnants of a mansion and a structure built in a bastion. There is a water pond here but the water is not potable. Opposite to the pond is the fort�s vast plateau with its fortified wall still intact. Towards the top side of the pond there is a flag pole and a path from here takes us to other side of the fort where there is a bastion. There are many water tanks on this route. One has to reach Nashik and proceed on the Nashik-Saputara highway. 74 kms from Nashik is a diversion towards Borgaon from where one route goes to Surgana while another to Saputara. Take the route to Saputara where Hatgadwadi village is 4 kms from Borgaon. Hatgadwadi is the base village for this fort. Keeping Hatgadwadi village on the left side take the tar road to Kalvan village. One comes across a dried up well on the left. After a 5 mins walk from this well take the off road path to the left which takes us on the mountain ridge. A 15 mins walk takes us to a Mango tree from where a diagonal path takes us to the fort. It takes around an hour from the base to reach the top.